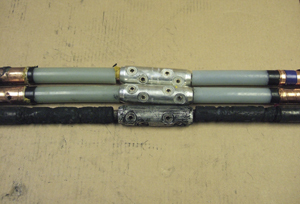 An 11kV transition joint failed shortly after commissioning at a refurbished Irish factory. The joint was cut out and forwarded to us for inspection. There was a massive amount of damage as a result of the failure. The heatshrink outer sleeve was severely damaged and the armour cage partly melted. Removing these exposed the 3 cores, one of which was completely destroyed. The other two cores, though superficially affected by the blast, were electrically sound. Breaking down the two remaining cores showed the installer to have removed the screen correctly, jointed the cores and installed all stress grading material and tubing according to the JI provided. For the amount of damage caused and only to one phase, we were at a loss to find a cause other than mechanical. After receiving further information from site along with a picture, it appears ropes were attached over the armour removal area and the entire joint and cable winched into a new position. This had buckled the armour cage, and forced one core into the sharp edge of the twisted cage piercing the core insulation tubes. Questions were also asked about the protection in place for there to have been this level of damage.